I love the unique fashions of the jazz age. At the same time, I love to take inspiration from the natural world. 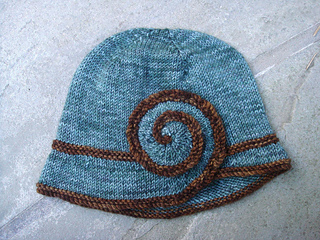 One day I dreamed up a cloche hat reminiscent of a snail’s shell, and (well, after a long series of failures) Escargot was born. Knit in a richly dyed, lustrous wool, Escargot is a perfect companion to a winter outfit and waiting for the train. 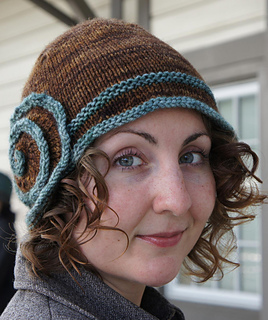 Warm and stylish, this pattern is also good for using up leftovers or showing off spinning experiments in the trim. Some hats are embellished with something added after the fact. 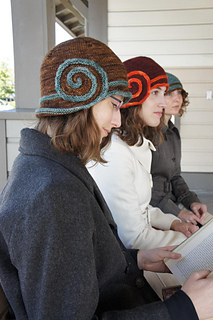 Escargot is knit all in one piece, from the brim to the top. Note: MC requires approx. 140yd and CC requires approx. 35yd. 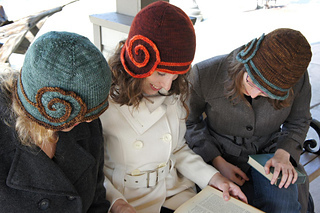 One skein of the above yarns in each of 2 colors will make 2 hats. In the Brim and Spiral section of the pattern, the abbreviation “sl m” stands for “slip marker” and is there to help you keep your place between the brim and spiral sections.